The Mountain Mystery | Just 50 years ago, no one knew why the Earth has mountains. Now we do. This is the story of how we figured it out – and how we keep learning. We love the superlative – biggest/smallest, widest/narrowest, and more often than not, the tallest, heaviest, strongest rather than the shortest, lightest, weakest. Not many travel posters feature the ‘averagest’ waterfall, tree, or lake. So it might seem against human tendency to seek out the center. But the center has got it’s own appeal, especially when attached to something big: the centre of the Universe, or the center of the continent. In the 1800s, many states tried to locate their county seats near the county center. The county seat usually hosted the county government, the county court, and the county jail. Being equidistant from all villages, it seemed fair. In my own childhood home county of Mercer, Pennsylvania, the town of Mercer became the county seat. I was 16 when I drove our old farm truck to Mercer so I could take my driver’s exam. I remember my father clutching his passenger door the whole way there, rather sure that he wouldn’t survive my poor driving, though I did come home with permit in hand. It was lucky for him that the county seat was centrally located. Had it been in Grove City, our trip would have been ten minutes longer. 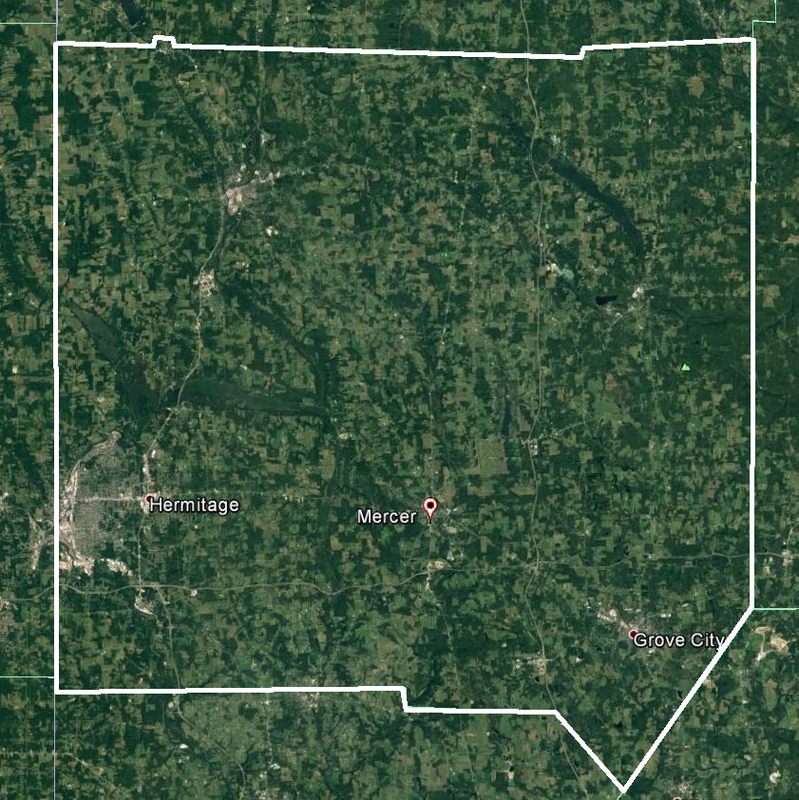 As you can see in the map, the county seat is near the county center (actually 7 kilometres south, but there is nothing but woods at the actual center). But what do you do with a place like Croatia? Croatia is one of my favourite countries. It’s got over a thousand beautiful Mediterranean islands, vast rolling vineyards in the north, an old Hapsburgian baroque capital (Zagreb), and a geographic center located in another country. To visit Croatia’s geographic center, one must travel over to the Serbian-controlled Republika Srpska, an enclave within Bosnia i Hercegovina. The very definition of balkanization. 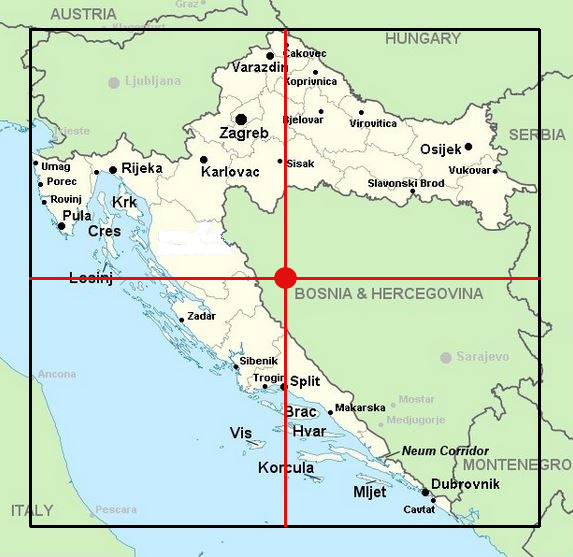 Obviously few Croats would use the geographic center to define their country’s center, but might enlist a cultural, historical, or even population center instead. Probably the appropriate center of Croatia would be its center of mass, something we’ll discuss soon. For years, the geographic center of North America has been described as this stone and mortar obelisk in Rugby, North Dakota, 60 kilometres south of Manitoba, Canada. I used to drive past the monument a couple times a year back in the days when I owned homes in Florida and Saskatchewan. 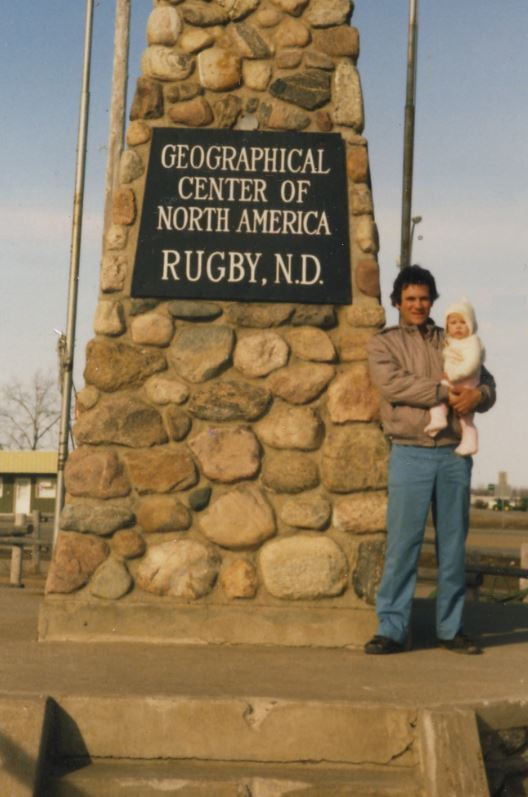 Here I am, thirty years ago, daughter in arms, standing at the center of North America. Had the monument been ten kilometres off Highway 2, this photo would have never happened. But there it was and so was I. In 1929, a US Geological Survey geographer cut out a cardboard map of the continent and balanced it on his finger. The balance point – the center of the continent’s mass (if all the mass of the continent were smeared around equally) was taken as the center of North America. 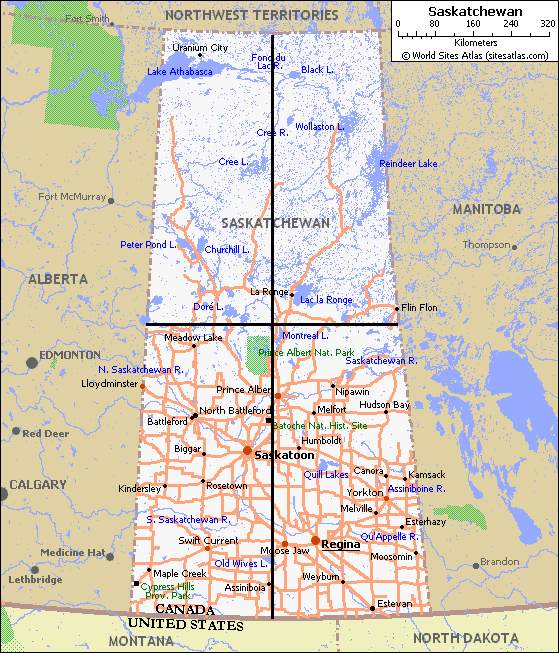 He found the spot near the North Dakota towns of Balta and Orrin, 30 kilometres southwest of Rugby. Both towns claimed to be the center, but Rugby sent an application to the US Patent Office to trademark the title, leading suckers like me to believe we’ve been to the center when, in truth, we hadn’t. But the laugh was on Rugby last summer when the trademark expired and a bar owner much further south in North Dakota bought it. So, briefly, Hanson’s Bar became the continent’s center. 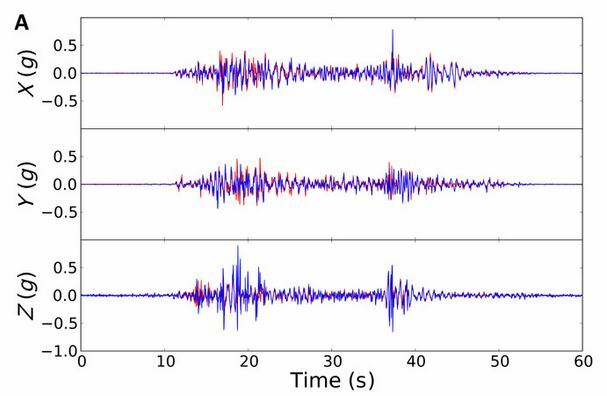 But hold on to your cowboy hat, the center is moving again. Now a State University of New York (at Buffalo) geographer wants to redefine North America’s center. Peter Rogerson has mapped a spot 175 km southwest of Rugby, North Dakota. His center is near the center of Center, North Dakota. The town – population 571 – got its name when it was determined to be the geographic center of Oliver County, North Dakota and thus chosen as the county seat, back in 1902. Center, ND, is only 30 kilometres north of Interstate 94, so Americans travelling from New York City to Seattle may consider taking an hour’s detour to stop, look, and have coffee at the Square Butte Diner in Center. Or maybe not, since the trademarked Center of North America(TM) is actually at a bar 115 km east. But an ambitious family would stop at both, I suppose. This all makes sense, of course. One wonders why it took almost 100 years to sum the great circle squares. I hope that Professor Rogerson can apply this to Croatia and move its mathematical center from Bosnia to Lekenik, Croatia, the village which Norm Jewison chose as Anatevka when he filmed Fiddler on the Roof. 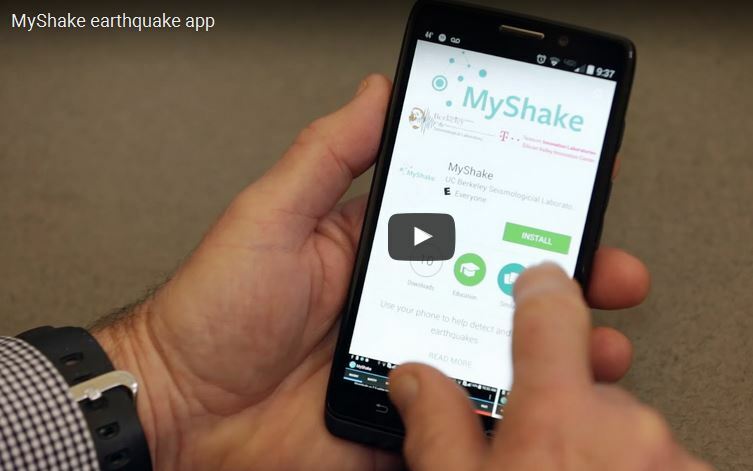 If this can be done, geographers will have proven their enduring value. 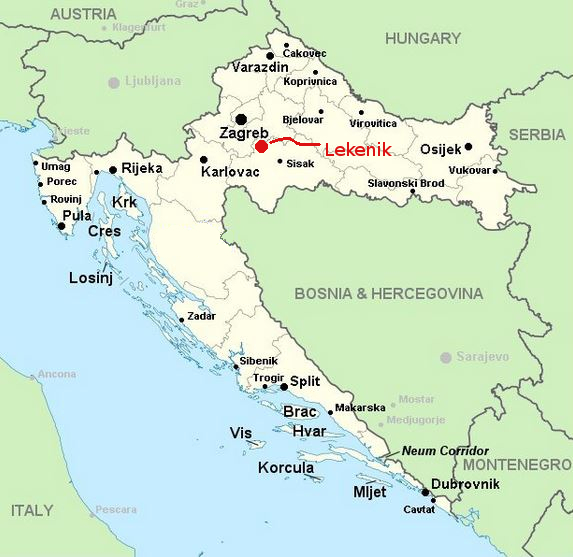 Is Lekenik Croatia’s real center of balance? It seems that youngsters who are not particularly gifted in science and math are more likely to want a science job later in life. Kids who excel in science are less likely to want to be scientists. At least, that’s the odd result from testing and polling 540,000 15-year-olds in 70 countries. The Programme for International Student Assessment (PISA) is an evaluation of the competency of a half million 15-year-old students, randomly chosen from the world’s 35 OECD (Organisation for Economic Co-operation and Development) countries and over 30 non-OECD countries (places like Croatia, Uruguay, China, Singapore, Russia). Here’s a link to PISA. You can get the raw data there and inspect their methods and summary reports. Every three years, the newest crop of 15-year-olds take the PISA Reading, Science, and Math exams. The OECD does this so various education techniques can be compared with the kids’ results. For example, what leads to higher scores: More homework? More money dumped into the education system? A smaller teacher/student ratio? (No, Sometimes, Yes.) If you are interested in this sort of thing, the reports and the PISA data are publicly available. PISA is also a ranking system enjoyed by gloaters in select countries. In reading, Canada tied with Hong Kong for second place in the world. (Singapore was number 1, USA #24, Russia #26). Singapore was number one in math, science, and reading. Canada was in the top ten in everything. Other high-scoring countries are Finland, Japan, Estonia, and China. The analysis indicates that a lot of factors make the difference. National wealth, priorities (sports/fitness, nutrition, health care), and culture interact to define the success of students. The Economist has a nice analysis of the results. While I was reading the tables of numbers, I happened upon some curious data. In the most recent assessment (2015), PISA asked participants: “Do you think that you will pursue a career in science?” From the answers, the OECD guesstimates how many future scientists may be entering university. On average, the number was encouraging – 26% of 15-year-olds worldwide think that their future career (as physicians, engineers, science-teachers, chemists, computer scientists, researchers, etc.) will involve science. But here’s the odd thing: youngsters who did poorly on the science exams were actually more likely to think that they will become scientists. The most blatant example of the gap between career aspirations and expertise is found in the country of Dominican Republic. Students there did more poorly than any of the other tested countries. 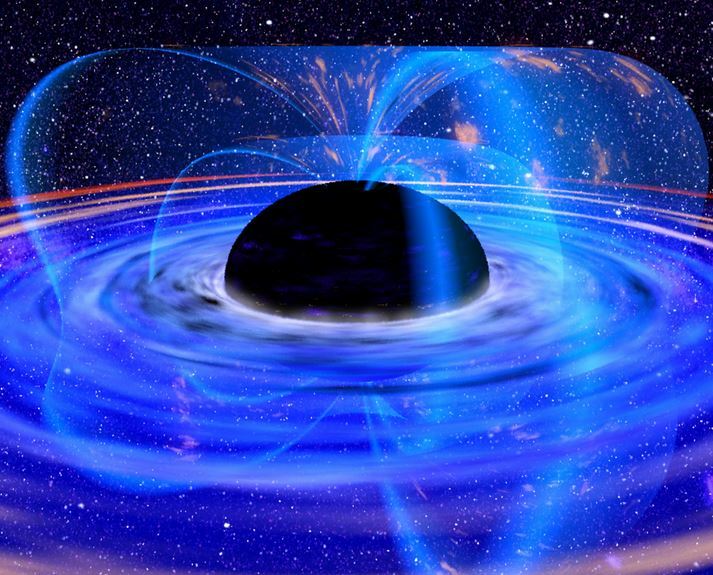 The average science score places 15-year-old D.R. students 7 academic years behind 15-year-olds in Singapore. In D.R., performance is at a Grade 5 level while in Singapore, the scores indicate a Grade 12 achievement. By the way, American students performed roughly 3 years behind the Singapore kids but just one year behind the world average. So, the Dominican Republic came in last in science skill. But that country was first in science career aspiration. 45% of Dominican Republic’s 15-year-olds hope to take a career in science, according to the PISA study. That’s higher than any other country. Some other countries showed a similar dichotomy, but not as severe. I did a simple Pearson’s correlation (Science aptitude and Science career aspiration). For the 70 countries, there is a negative 0.49 correlation, which is reasonably strong. The Dominican Republic is a bit of an outlier, so I masked it and the correlation went down just a little, to -0.45. My plot, below, is a bit scary – it is unfortunately obvious that decreasing skill is accompanied by increasing confidence. The USA is below the world average in science (and math and reading) but with 38% expecting a career in science, many of its children are nevertheless thinking that they’ll have a science career. I realize that there can be a lot of reasons for boys and girls to claim that they will pursue science – motivators could be cultural and financial. However, I wonder if hubris also plays a role. Even doing poorly in science, some 15-year-olds nevertheless think that they will work as scientists. It may be a case of not knowing the unknown. I’ve fallen into this same trap myself. After flipping through an easy-to-read science book (How to Remove Your Own Appendix, or Quantum Explanations of Everyday Accidents), I’m sure I can remove my own appendix or teach nuclear physics because it just sounds so easy. I’m not an expert, but heck, I can do it. 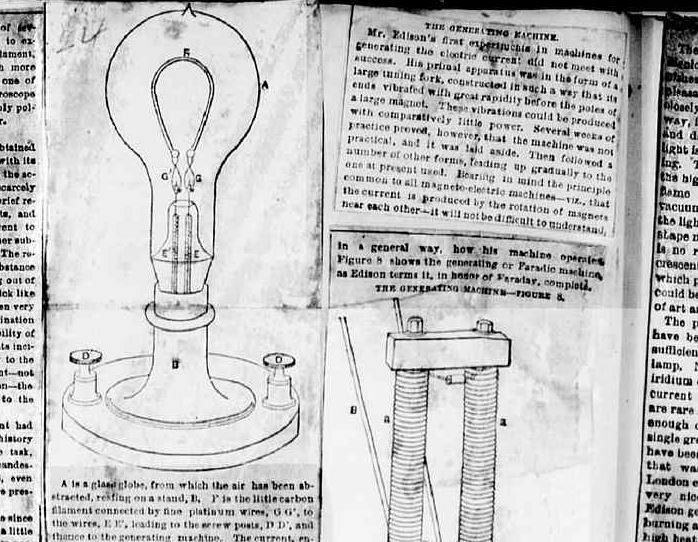 Edison’s light, reported in the Washington Post four days later. The text says “A” is a glass globe from which air has been abstracted, resting on a stand, “B”. What are the odds that three important electricity developments should all occur on December 20th? Probably, statistically, rather good. So I’ll not make much of the coincidence. Impending winter darkness was not a likely motivator – in the case of Edison’s light bulb, the electric light had been around for years before he claimed to invent it and as the New York Herald pointed out, Edisnon’s people had been working on their version for fifteen months. On December 20, 1879, in a news-press event, Thomas Edison showed off a glowing light bulb at Menlo Park, New Jersey. He actually had a working model three months earlier (October 1879). Edison’s poorly-paid immigrant scientists had tested thousands of materials before they discovered that carbonized cotton filaments in a vacuum inside a glass bulb would throw a strong light without breaking. There was quite a fuss about the magic ball of glass, but Edison’s team had already been bested by Canadian medical student Henry Woodward who had received the first patent for the incandescent light bulb five years earlier. Edison’s company bought the Canadian patent and Edison took credit for being really, really smart. On December 20, 1880, just one year after Edison invited the press to witness the little glowing glass globe, Broadway was lit by arc lighting which is much brighter than the punny incandescent bulbs that Edison’s company was selling. This eventually led to George Benson’s expression, “The lights are always bright on Broadway”. Except when there’s a massive power outage. Also on December 20 (but in 1951), the first radioactive electricity hit the wires from the Experimental Breeder Reactor I, at the Argonne National Laboratory in Idaho. On that day, a string of four light bulbs lit up, using the world’s first nuclear-generated electricity. The lab’s director, Walter Zinn, had worked on the Manhattan Project and was a leader on developing the atomic bomb. Zinn, from Kitchener, Ontario, ran a staff of scientists who used a football-sized nuclear core to make enough electricity to eventually supply all the power for its own building – you might say that a secretive place in Idaho went ‘off-grid’ for the first time on December 20, 1951. The first electric Christmas lights were a cheesy promo-gimmick by Thomas Edison who lit his Menlo Park lab with strands of lights visible to rail passengers riding past his shop. That was Christmas, 1880. 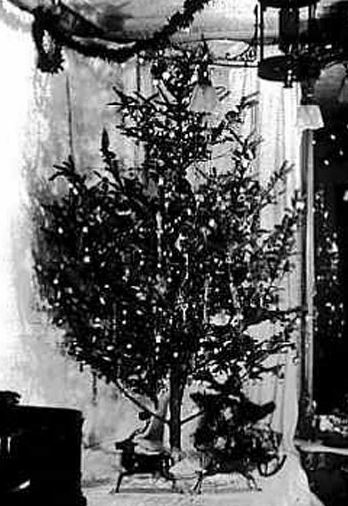 Two years later, Edward Johnson, Edison’s partner in the Edison’s Illumination Company, patriotically wrapped 80 red, white and blue hand-wired light bulbs around a Christmas tree. That’s his tree, in 1880, to your right. Looks like he waited too long to buy his balsam fir, doesn’t it? It took another 40 years before electric lights were safe and reliable enough for the public. Until then, people hung unsafe and unreliable burning candles to their highly flammable dead pines, often just before their wooden frame homes caught fire. 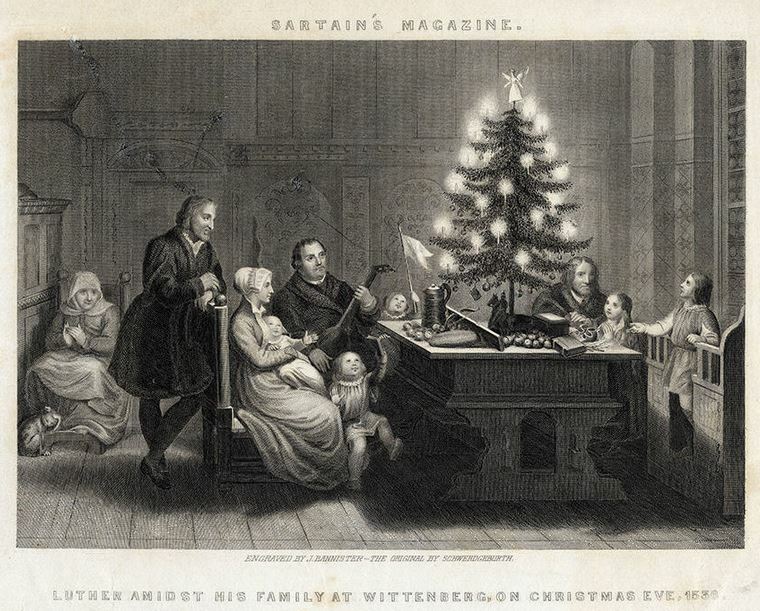 Martin Luther’s Combustible Christmas Tree, around 1530. The Washington Post recently ran a story about the late Abdus Salam, a physicist who won the Nobel Prize almost 40 years ago. The piece concerns the politics of naming a building at a Pakistani university in honour of a man from a religious minority background. Salam’s family belonged to the Ahmadiyya community – followers of a Muslim faith deemed heretical by Pakistan’s dominant Sunni Muslims. The religion was formally declared ‘non-Islamic’ by the Pakistani government in 1974. Before the new decree, extremists sometimes attacked and burned Ahmadi businesses, mosques and schools; after the decree, members could be imprisoned for their beliefs. In protest and for safety, Dr Salam moved to London. Before leaving Pakistan, Salam had been the chief science advisor to Pakistan’s president, had contributed to theoretical and particle physics, was the founding director of the Space Research Commission (SUPARCO), and had established the Theoretical Physics Group (TPG) in the Pakistan Atomic Energy Commission. He helped stage events that led to Pakistan’s nuclear weapons. He was undoubtedly loyal to his country. 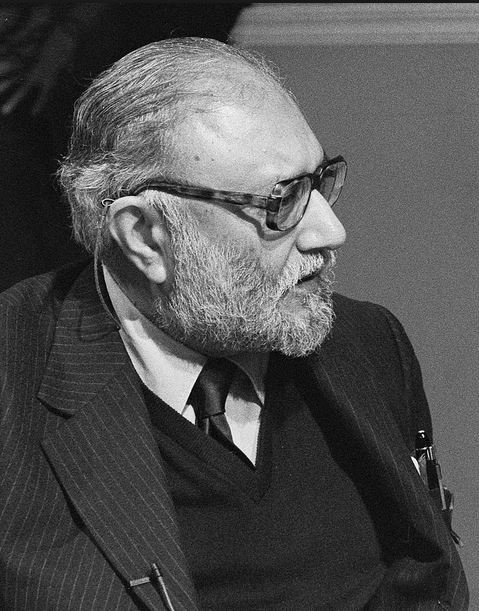 Abdus Salam is considered a major figure in 20th century theoretical physics. Salam had worked on the Grand Unified Theory, supersymmetry, the magnetic photon, vector meson, and neutrinos. His name is on the Pati-Salam model which uses four flavours of quarks to predict high-energy right-handed weak interaction with heavy W’ and Z’ bosons. The Pati-Salam Theory was proposed in 1974, is considered a mainstream theory, but faces competition from the Georgi-Glashow SU(5) unification theory. We still don’t know how this will play out or what it will mean for our survival as a species. Probably not much. Salam was the first Pakistani and first Muslim to receive a Nobel Prize in science. He shared the 1979 Nobel with Sheldon Glashow and Steven Weinberg for contributions to the electroweak unification theory. Salam was connected, political, energetic, influential, and a brilliant scientist. But having a school building named for him now, 20 years after his death, has been a politically charged exercise. It took courage for the committee to propose the name change that would recognize their fellow countryman’s achievements because “officials often feel the need to appease religious hard-liners at the expense of progress and international stature.” The downside of their bold move is it could incite looting, arson, and even violence against the name-change advocates. In America, too, it may sometimes “require an act of courage for the government to rename a university science center after a native-born Nobel Prize-winning physicist who died two decades earlier.” When I read about Salam, it reminded me of an American Nobel Prize winner. There was an attempt to get a new high school in his hometown named for him, but the effort failed. I think it failed because Thomas Hunt Morgan, a Nobel Laureate, was an atheist evolutionary biologist, and his home city was in Kentucky. Thomas Hunt Morgan was the first Nobel Laureate to win for research in genetics. He grew up in Lexington, Kentucky. This year, 2016, is the 150th anniversary of his birth – a notable milestone in biological science history. But it passed largely unnoticed. Nevertheless, Morgan was the first to demonstrate that genes are carried on chromosomes and are the basis of heredity. He was the first to show the location of specific genes on specific chromosomes – we now measure distance along chromosomes in centiMorgans. He also proposed that mutated genes lead to evolved species. His discoveries form the basis of modern genetics. Morgan built the world’s first modern genetics lab. The lab goes way back to the time shortly after Gregor Mendel’s genetics work had been rediscovered (around 1900). By then, Morgan had finished his first two degrees at the University of Kentucky (1890s) and had a freshly earned PhD from John Hopkins. He was doing embryology research when Mendelian inheritance was ascending. In 1900, at Columbia, Morgan happened upon a mutated (white-eyed) Drosophila. It occurred to him that the fast reproductive cycle and odd mutations of his fruit flies would make a much faster and more easily controlled subject than Mendel’s peas. From that, Morgan’s Fly Room was built – a dingy space where bugs were bred and mutations documented. 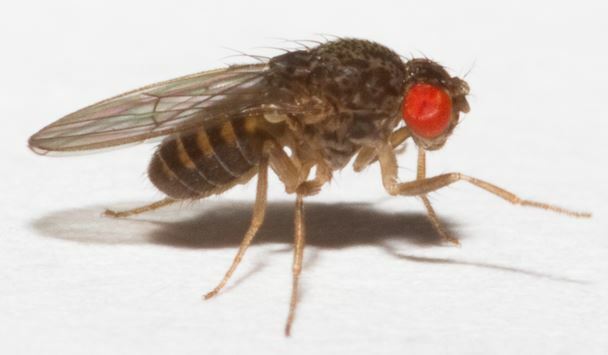 Generations of flies could be tested within months. Drosophila is still the go-to animal in genetics research. Morgan wrote 22 books and at least 370 papers, though he sometimes let his students take full credit for joint work, so the actual number is certainly greater. One of his doctoral students was the famed Theodosius Dobzhansky, who worked with Morgan after Thomas Hunt Morgan moved to California to found Caltech’s biology division. Dobzhansky’s work influenced another generation of evolutionary biologists as well as the public, especially through his essay “Nothing in Biology Makes Sense Except in the Light of Evolution” . Dobzhansky (1900-1975) was an Eastern Orthodox Christian and believed in a personal God that directed the evolution of all life, including humans. Morgan, who described himself as an atheist, had no interest in his student’s efforts to reconcile religion with science. Mutations due to environmental interference (cosmic rays, radiation from soil, chemicals) were inherited on the genes which Morgan had discovered. 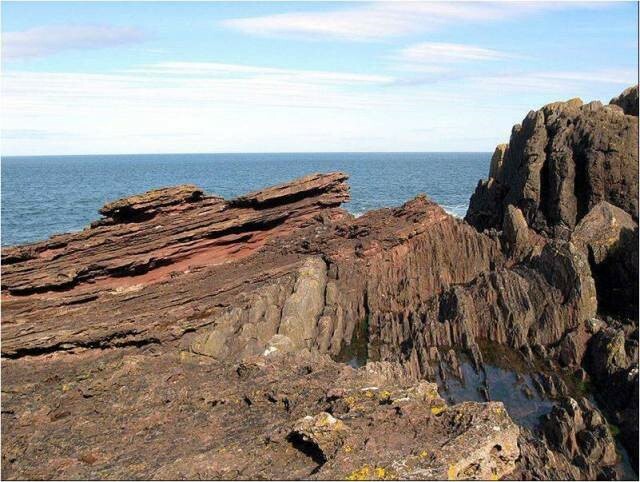 Mutations explained the cause of evolution; genes on chromosomes described the mechanism. 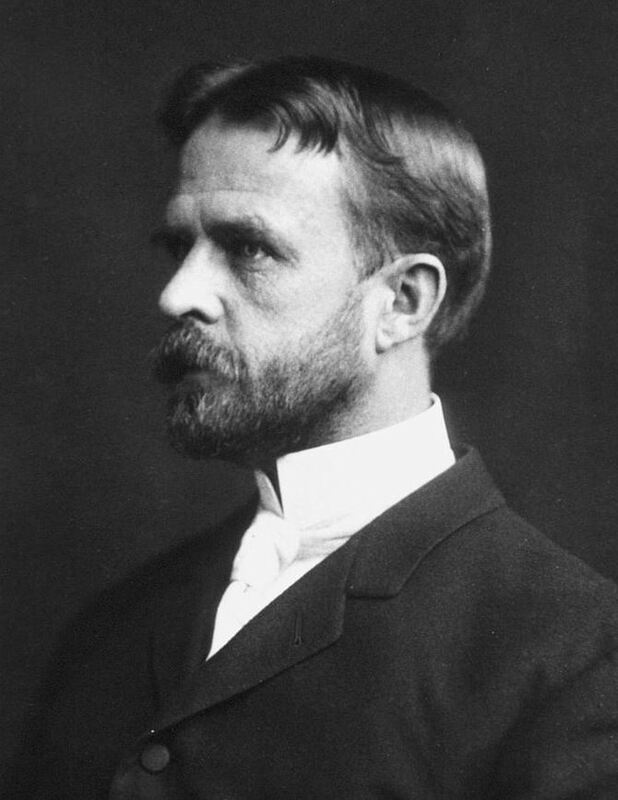 His stunning discoveries and explanations of their significance led Thomas Hunt Morgan to be elected President of the American Association for the Advancement of Science, President of the American Morphological Society, the American Society of Naturalists, and the National Academy of Sciences. He was a member of the Royal Society of London. And, of course, there was his 1933 Nobel Prize. But all of this was hardly noticed during this year’s sesquicentennial of Morgan’s birth. I suspect nary a fireworks display was launched in his memory. The recent suggestion to get a Lexington high school named Thomas Hunt Morgan Senior High also seems to have failed. But like his Pakistani Nobel colleague, Morgan was honoured with a university building in his name. I am well aware that comparing the religious extremists in Pakistan with those in the USA is a very broad stretch. Salam was a Muslim, but of a minority sect. His people were discriminated against and violence is possible because of the science building’s bew name. Maybe because they are an invisible minority, agnostics and atheists aren’t normally the targets of violence in the States. But they are sometimes discriminated against in hiring, usually can’t get elected to public office (if their non-religion is known), and they are generally the least liked and least respected group in America (according to Pew research). If Morgan’s work and beliefs had been generally known, some elements of the public might have protested naming the new biology building after him in 1966. It would not be easier today. Nevertheless, in 1966, 21 years after his death, the University of Kentucky named its new Thomas Hunt Morgan School of Biological Sciences building for him. Morgan was an atheist evolutionary biologist – born, raised, and educated in Kentucky. The Nobel Laureate was arguably America’s greatest geneticist. So, in the state of Kentucky, there is a building named in honour of an atheist evolutionary biologist who won the Nobel Prize – but there will likely never be a T.H. Morgan Senior High School.